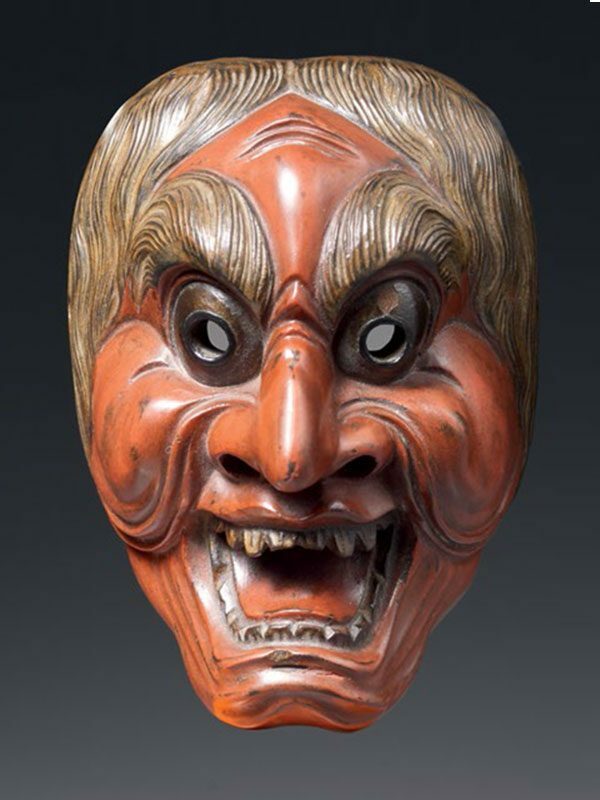 A model of a life-like Noh mask of an old man, depicted with a large, hooked nose, bushy eyebrows, bulbous eyes and with his mouth open, baring his teeth. The wooden mask has a thin coat of dark red paint applied overall. To the side of the mask are two holes; the original full-sized mask would thus have been attached to the face of an actor. Noh is an art form derived from the Sino-Japanese word for “skill” or “talent” and a major form of classical Japanese musical drama that has been performed since the 14th century. Noh is often based on tales from traditional literature with a supernatural being transformed into human form as a hero narrating a story. Noh utilises masks, and there is a great variety of them. There were originally about 60 basic types of noh masks, but today there are well over 200 different kinds in use. Exactly when the noh mask came into being is not entirely clear, however it is believed that masks, and their names still used today, were developed from the mid to later part of the Muromachi period (1392-1573). The current model of a mask strongly resembles the so-called Aka-Hannya mask, but does not have the horns that typify that mask. Hannya is a very strong demon and a tragic victim. The Japanese think it is a charm to ward off evil spirits.